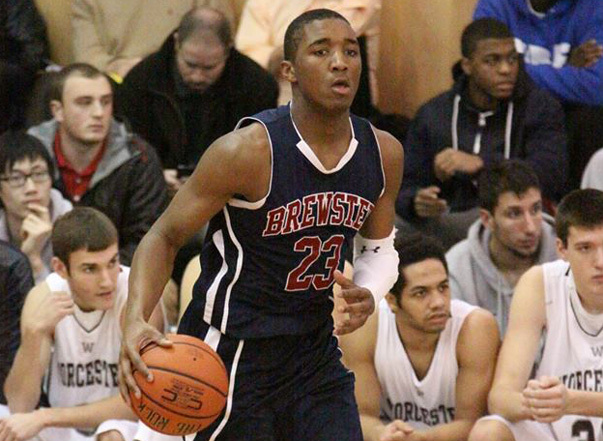 Class of 2015 Brewster Academy (N.H.) guard Donovan Mitchell, who received a scholarship offer from Indiana in early June, will take an official visit to Bloomington this fall, according to NBCSports.com. Mitchell, a native of Elmhurst, New York, has been hearing from the Hoosiers frequently in recent weeks. According to the report by NBCSports, Mitchell will also take an official visit to Louisville. The 6-foot-3, 180 pound guard is rated the No. 91 prospect nationally in the 247Composite. He’s also being recruited by Boston College, Cincinnati, Creighton, Florida State, Georgia Tech, Memphis and Providence, among others. Hopefully we’ll start to hear from big guys soon. OMG another guard? What is Tom Crean doing??!! He’s loading up, that’s what he’s doing. Ya see, Tom Crean’s bread and butter is a guard heavy, athletic wing roster. His offense requires a run, run, run, shoot, shoot, shoot mentality. People are freaking out about our lack of a center.. when coach Crean’s team has never required one. He only recruited Zeller and Vonleh because they were very special talents. He had to try to focus the offense around them, and never had to do that before as a head coach. .that’s where our headaches came in. Mostly, they were from our lack of understanding the situation at hand. Trust coach Crean. This is the first season he’s had a team at IU that embodies his coaching style from top to bottom. Sit back and enjoy folks. Things are about to get real interesting in Hoosier land. Whew..thank goodness…glad to be rid of those 5 star 6’10+ first round draft choices then! Let them go to someone who knows how to use them! I’m all for this philosophy because if he succeeds, that’s excellent, if he fails, then, we have a solid direction to go in. Would love to see analysis on who is the best big available for CTCs offense. I’d actually say hanner is pretty close. One of them reported on the forum who is coming for an offical visit is Juwan Morgan. 6’9 or 10″ wt 220 depending on what service I look at he is a 4 star as is mitchel on the 247 rankings. Morgan is very athletic and can run the floor well. Good motor! This kid reminds me of a more athletic DSR. Seems like a really solid combo guard…. Did you see him take any jumpers? I don’t think we can evaluate any recruits in terms of “fit” for 2015-2016 and beyond because I don’t think we can know who is going to be on the roster or what positions will be needs. Right now, it’s safe to say we don’t need a guard in 2015 unless the player is an absolutely elite talent. However, a couple of guys could transfer/go pro early/get injured/etc. and what was a strength could quickly become a need. So, I guess we can only evaluate each player in a vacuum and how we think they could play in a Tom Crean-led team. Donovan Mitchell appears to be a powerful guard (I’ve read conflicting reports about whether or not he is actually a PG) that can jump and attack the rim. Based on three “scouting reports” I read, he rarely shoots and is in attack-the-rim mode nearly 100% of the time. He’s heard from Indiana a lot recently and is from New York so, I think it’s safe to say that Chuck Martin is heading the charge on this one and this could be his first “get”. I would expect to see some movement in the 2015 class sometime soon…but I think the expected time frames on recruits is generally moving back so, who knows? This guy has an impressive dunk video.. If he can shoot, it’s a no-brainer! Crean and you are poor students of history regarding B1G champions if either of you thinks that a guard heavy-athletic wing oriented team will ever do well in conference play. While it is not imperative to have an All-American big in the front court, whomever is there better be a good defender, very good to great on the glass, a decent rebounder and reasonably mobile. I’m not sure that many of those who post on here are going to be able to “sit back and enjoy”; however, I do believe that things will be getting in Hoosier land. Every team needs someone who can rebound and get the best percentage shot sometimes. Also be able to play defense at the post. With Cody Zeller and Noah Vonleh going high in the NBA draft you would think big men would be knocking the doors down at IU. A big man would thrive at IU and play right away. And don’t tell me its Tom Crean, i sure he’s trying to get another big man.